If you enjoy reading, and use Beeston Library, you now have the opportunity to read some books you might not normally be familiar with, and at the same time help to choose the New Writers UK ‘Book of the Year’, in its 2013 competition ‘The Big Beeston Book Read’ to be held over the next three months. Members of New Writers UK – an organisation supporting small, independent and self-published authors – will this year be holding its annual Book of the Year Competition in this area. The winner normally arranges the following year’s. The 2012 competition – ‘The Great Kimberley Book Read’ – was won by Chilwell author Alan Dance with his historical novel ‘Leen Times’ and as a local resident he has chosen Beeston to host this year’s competition. Eight books, all published by members during the past year, have been entered, and readers are invited to borrow any of these from Beeston Library and give them a score. Each of the authors has donated four copies of their books to the Nottinghamshire County Library Service, which will then remain as part of their stock for future readers to enjoy. The competition will run from Saturday 20th July to Saturday 27th October, so there is plenty of time to read all eight books, should you wish. 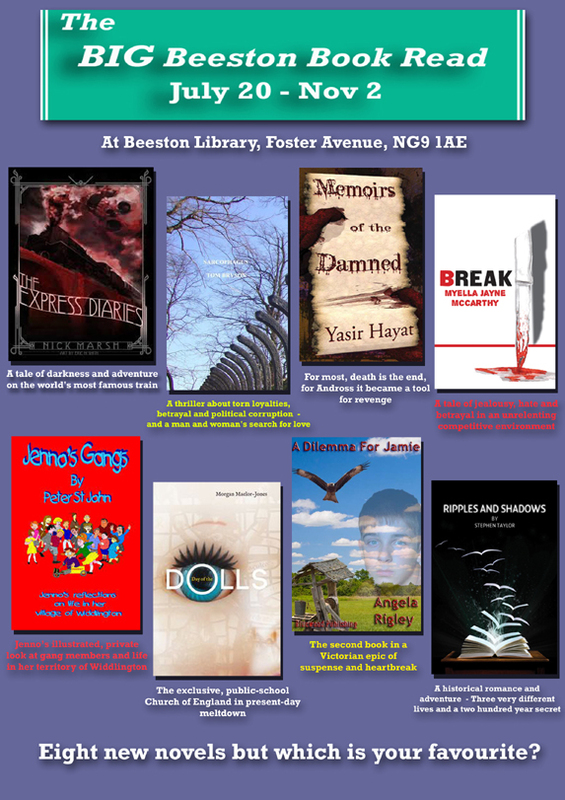 The winner will then be assessed according to the scores awarded by readers, and the presentation of the award will take place in November at Beeston Library. The competition is to be launched by the Mayor of Broxtowe, Councillor Iris White, on Saturday morning 20th July at Beeston Library at 11.00 and is open to all members of the public. Three short, 15 minute talks, will then be given by members of New Writers UK on different aspects of writing, two by previous winners. Gloria Morgan (2011 winner) will talk on ideas and inspiration – ‘What William the Conqueror did for me’; Alan Dance will speak about ‘Local history in historical fiction’, and Tom Bryson on writing scenes –­ ‘A knock in the middle of the night’. The winner will be announced in November with BBC Radio Nottingham’s John Holmes presenting the prize. 11.10am – Talk, from author A R Dance: Local history in historical fiction. 11.25am – Talk, from author Gloria Morgan, on ideas and inspiration: What William the Conqueror did for me. 11.45am – Talk, from author Tom Bryson, on writing scenes: A knock on the door in the middle of the night.